People Wanted Stencils. So We Gave Them Stencils. Looking for ideas of what you could do for your next DIY art project? Or maybe you just want to vandalize a co-workers parking spot with an innapropriate stencil. Either way, we have solutions for you. 1.- We designed this in Illustrator. We then contour cut a special stencil vinyl that the customer then applied to the surface. The customer then painted in all the lettering with One Shot gold paint. The end result looks like this! Pretty sweet “hand painted” look. 2.- Someone walked in with an 8kb sized file…for those of you who don’t understand how small that is, that’s like.. as small as a dime on your computer monitor. Really tiny. 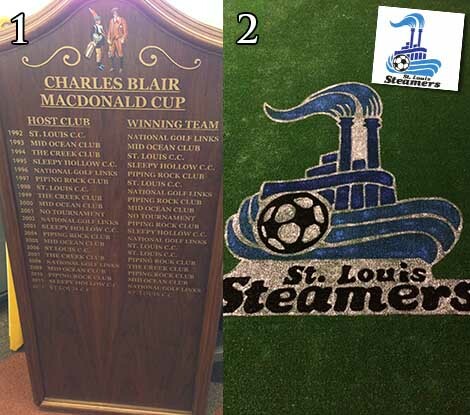 Anyway… they wanted to paint the Steamers logo on the small astroturfed soccer area in their basement where the kids play. Very cool idea. So we used our photoshop powers, turned the 1″ square image into 3 foot image. Printed it out very inexpensively in black and white on our blackline machine, and the customer went home and did this. We were very impressed with the results.